Next generation networks and service providers are rapidly evolving in order to satisfy the demands of an increasing number of users. Nowadays, one of the most relevant research lines in the Heterogeneous Wireless Access Networks realm is the use of procedures and mechanisms so as to provide intelligence to the network, with the main goal of optimizing its performance. Furthermore, mobile communication users are becoming more demanding, and thus it becomes essential for the providers to be able to offer a competitive value for money. This paper pursues the objective of obtaining, from an analytical perspective, the optimum price assignment strategy according to the characteristics of a particular scenario, analyzing the improvement attained with such optimum pricing policy as compared to a more traditional one. Game theory techniques, which are gathering the interest within the communications scientific community, are used for the analysis. López, C. [et al.]. 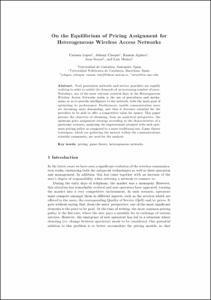 On the equilibrium of pricing assignment for heterogeneous wireless access networks. A: International Conference on Mobile Networks and Management. "Proceedings of the 4th International Conference on Mobile Networks and Management (MONAMI 2012)". Hamburg: Springer, 2012, p. 1-15.